NWG has just returned from the Oval and she has had an interesting day. 1. England won the toss and should have batted second. 2. The weather had obviously come from the West Indies. 3. KP should have scored more runs. 4. Actually the whole team should have scored more runs. 1. NWG never believed that England would make it out of the group stage, let alone get to the semi-final, so she's not too disappointed. 2. She is reminding herself that it is only a game (that's a tough one). 3. It is a fact that the West Indies are a better twenty20 side than England. 4. She was at least at the game of the tournament (India v England). 5. English weather is a curse. They just have no way of accelerating the scoring rate. Some of those batsmen keep looking for singles. They lacked Flintoff's big hitting, maybe should have had one of the bowlers like Broad batting up the order. Further proof that T20 is a joke are those rain-shortened matches. How can you give the second team 9 overs to make 80 runs with all 10 wickets. There was another game the other day where each team had 5 overs. Is that cricket? No Ben, it is not. NWG will be petitioning for some wimbledon roof action for the Oval in future. England were to lose this. They rightly did to join their Ashes partner and prepare for more worthwhile contest. Ashes wait cant be any more longer. btw adding you up. can you add me in the blogroll. 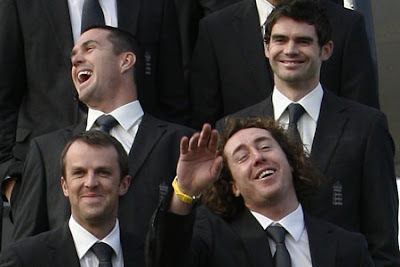 It could be worse, South Africa could be in the Semis.... oh.... never mind.